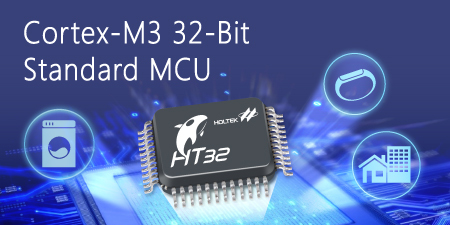 Holtek is delighted to announce the release of its new Arm® Cortex®-M3 based 32-bit advanced Flash Microcontroller devices, theHT32F12345/ HT32F12365/12366/22366 series. These new 32-bit Flash devices include a high operating speed of up to 96MHz and are suitable for a wide range of applications such as TFT-LCD displays, biological recognition, USB game peripherals, intelligent home appliances, home automation products, consumer electronics, data collection, recorders and so on. The HT32F12345 and HT32F12365/12366/22366 series contain 64K~256K bytes of Flash Program Memory and 16K~128K bytes of SRAM Data Memory. The devices include richer peripherals and high speed interfaces such as USART, UART, SPI, I2C, USB 2.0 FS Device. Other features include WDT, RTC, comparator as well as many others. The series include a crystal-less USB solution for USB applications. The External Bus Interface function can be used for high-speed data transmission, which is especially suitable for TFT-LCD relevant applications. The HT32F12365/12366/22366 series also provide AES-256 encryption mechanisms. The HT32F22366 device provides a CMOS Sensor Interface function, which can quickly capture image data. The HT32F12345/HT32F12365/12366/22366 series are supplied in 46-pin QFN and 48/64-pin LQFP package types and contain from 37 to 80 GPIO pins. The HT32F12365/12366/22366 series are also supplied in 100-pin LQFP package type. The full series operate with a single power supply operating voltage range of 2.0V~3.6V and an industrial temperature range of -40°C~85°C. With regard to development tools, the devices are fully supported by professional IDE suppliers including IAR and Keil. Additionally, Holtek also provides its own low cost demo boards and development platform kits. The Holtek development platform includes an ICE e-Link32 Pro, a full set of peripheral driver program libraries, a range of application example source code as well as application development handbooks. With Holtek's integrated ISP (In System Programming) and IAP (In Application Programming) technology, all the tools are at hand for rapid firmware updates and improvements to product flexibility and production efficiency. These features allow customers to reduce their development time and seize the initiative for new product market entry.